In early March, Panini America will throw out the first pitch on the 2019 baseball collecting season by unveiling the flagship 2019 Donruss Baseball, the quintessential season-opening product that delivers a deeper veteran base checklist, new parallels, classic parallels, updated inserts, autographs, memorabilia and more. On average, each hobby box of 2019 Donruss Baseball (eight cards per pack, 24 packs per box, 16 boxes per case) will deliver three autograph or memorabilia cards, five numbered parallels, 10 Rated Rookies, 15 Diamond Kings, 24 Variations and five inserts. 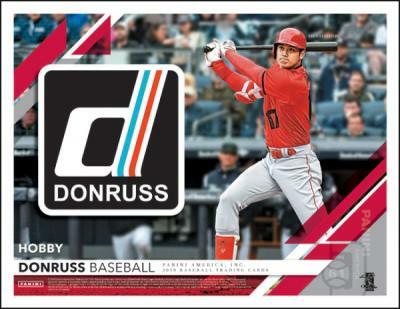 2019 Donruss Baseball boasts vibrant autograph and memorabilia checklists featuring the likes of Signature Series, Retro 1985 Signatures, Majestic Materials, new San Diego Chicken autographs and memorabilia, Rated Prospects Autographs and a few surprises. The product will also celebrate the game’s landmark 150th anniversary with a tribute parallel printed on classic clay-coat stock. Additional highlights of 2019 Donruss Baseball include . . .
New parallels including 42 Tribute and Holo Backs as well as trust staples such as Season and Career Stat Lines, Artist Proofs and Press Proofs. Updated takes on calling-card inserts such as Highlights, Action All-Stars and Franchise Features. In addition, the ultra-rare Whammy insert returns with five new subjects. The rare Recollection Collection buyback program featuring on-card autographs on original Donruss classics. Retro 1985 is a blast from the past, using a card designed inspired by 1985 Donruss Baseball. With the 2019 rookie class shaping up to be the deepest in recent memory, there will be plenty of sought after Rated Rookies to chase. Visit the official online store of Panini America to shop for your favorite Panini America baseball products.